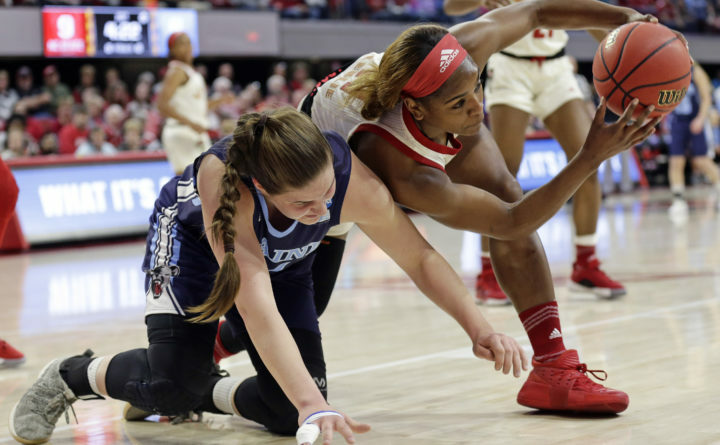 Maine's Fanny Wadling, left, and North Carolina State's Kiara Leslie chase the ball during the first half of a first round women's college basketball game in the NCAA Tournament in Raleigh, N.C., Saturday, March 23, 2019. The University of Maine women’s basketball team produced a much better performance against 10th-ranked North Carolina State University on Saturday afternoon than it did in December. But it wasn’t good enough to pull off an upset. Graduate student Kiara Leslie scored a game-high 20 points and 6-foot-5 freshman center Elissa Cunane contributed 16 points and nine rebounds as third-seed North Carolina State posted a 63-51 victory over the 14th-seeded Black Bears in their NCAA basketball first-round tournament game at Reynolds Coliseum in Raleigh, North Carolina. North Carolina State (27-5) used a 10-0 first-quarter run and an 11-0 second-period spurt to build a 17-point halftime lead en route to the victory in the Greensboro Regional. The Wolfpack faces Kentucky in Monday’s second-round game. Kentucky beat Princeton 82-77 earlier Saturday. N.C. State built a 50-17 halftime lead in routing UMaine 84-46 in the first meeting. UMaine had its 14-game winning streak snapped and wound up 25-8. It was UMaine’s first loss since a 49-46 setback at Hartford on Jan. 16. Leslie, All-Atlantic Coast Conference first-team guard, scored 13 of her 20 points in the first half and sophomore guard Kai Crutchfield posted 10, including the final seven of the half on a rare four-point play and a 3-pointer at the buzzer. That capped the decisive 11-0 run that produced a 39-22 halftime lead. But the resilient Black Bears battled back in the second half and got within 11 with 3:25 left in the third period thanks to a 5-0 run on Dor Saar’s jump shot and Tanesha Sutton’s 3-pointer, her only points of the game. However, the Wolfpack always had an answer and Cunane’s basket in the paint with 28 seconds left in the period gave them 51-37 lead heading into the fourth quarter. UMaine couldn’t get any closer than 13 the rest of the way until Parise Rossignol’s 3-pointer with 34 seconds left. “That run at the end of the [first] half really hurt us. That was tough. But we regrouped and got to within 11. We just couldn’t get over that hump,” Vachon said. Leslie finished with six rebounds while Crutchfield, who averages just 5.8 points per game, wound up with 14 points, five rebounds and two assists. DD Rogers produced seven points, eight rebounds and three assists. The Wolfpack held America East Player of the Year and leading scorer Blanca Millan (17.6 ppg) and Sutton (14.6 ppg) to a combined seven points on 3-for-23 shooting from the floor. Millan’s four points and Sutton’s three were season lows for both. The duo was held scoreless in the first half as they were 0-for-12 from the field, including 0-for-8 for Sutton. “They have led us all year long. They just had a tough shooting day today,” said Vachon. Graduate student guard Rossignol of Van Buren concluded her career with a team-high 19 points. She shot 7-for-13 from the floor, including a 5-for-9 beyond the 3-point arc, and grabbed five rebounds. Sophomore point guard Saar registered 16 points and five rebounds. She shot 50 percent from the floor (6-for-12) and was 4-for-8 from the 3-point line. An emotional Vachon wept during the postgame news conference when talking about the departing Rossignol and Sutton. Junior center Fanny Wadling, who missed the December game with a concussion, tallied nine points, eight rebounds and three blocked shots. “Having Fanny back was huge [on the boards]. They didn’t get any offensive rebounds in the second half,” said Rossignol, who took advantage of open shots as N.C. State sagged in on UMaine’s post players. NC State, which outrebounded UMaine 50-26 in December, grabbed a 38-29 edge on Saturday. “They were taller than us in every position so we had to play hard and box,” said Saar. Millan missed all nine of her 3-pointers on her way to a 2-for-12 shooting day, but she did pull down seven rebounds, dish out five assists and make two steals. Sutton concluded her career with three rebounds, five assists and three steals to go with her three points. She was 1-for-11 from the floor, making one of her season-high six 3-point attempts. The Wolfpack clogged the lane to prevent the aggressive Sutton from penetrating and gave her shooting space from the 3-point arc, where she shot only 25 percent this season. Millan was guarded effectively by Leslie, a first-team All-ACC defensive team selection. Millan got open from time to time but couldn’t connect. N.C. State shot 46.2 percent overall (24-for-52) and 28.6 percent (6-for-21) from the 3-point arc while UMaine went 20-for-59 (33.9 percent) and 29.7 percent (11-for-37), respectively. N.C. State outscored UMaine 9-0 from the free-throw line as the Black Bears did not attempt a foul shot against a team that ranks second nationally in fewest fouls committed per game (12.5). NC State outscored UMaine 32-6 in the paint and 16-3 off turnovers. N.C. State shot 50 percent from the floor in the first half compared to UMaine’s 31 percent and outrebounded the smaller Black Bears 23-11 over the first 20 minutes. Vachon praised NC State coach Wes Moore and his team, which was without two injured starters and had only eight healthy players. “He is a great coach and a classy man. They have had to reinvent themselves to get where they are and they’ve done an impressive job,” said Vachon. A year ago, UMaine reached the NCAA tournament for the first time since 2004 but was eliminated in the first round by the University of Texas, 83-54.